The best-selling over-ear headphones of all time on Amazon aren’t made by a big-name brand like Beats. Instead, they’re made by a company that offers the same attention to detail and similar great sound quality, but at a fraction of the price since it doesn’t have massive marketing bills to cover. The Mpow 059 Bluetooth Headphones have been best sellers on Amazon almost since they were first released. They have now amassed an impressive 4.5-star rating from more than 14,750 customer reviews, which is obviously no easy feat. 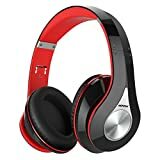 If you don’t already have a pair, or if you’re looking for the perfect gift for a friend or family member, you’ll be happy to learn that these awesome headphones are currently on sale at their lowest price ever. Use the coupon code 6OOYWM24 at checkout and you’ll be able to pick up a pair for just $27.99.